On the 2nd (Sun), step off the mainland to explore Island of Lokrum and then wander the streets of Old Town. Get ready for a full day of sightseeing on the next day: identify plant and animal life at Wildlife Areas, take in the local highlights with Walking tours, then explore the ancient world of Walls of Dubrovnik, and finally get a taste of the local shopping with Samostan Sv.klare. For photos, ratings, other places to visit, and other tourist information, read Dubrovnik trip planner . Kolkata (Calcutta), India to Dubrovnik is an approximately 17.5-hour flight. You can also do a combination of flight and bus. The time zone difference when traveling from Kolkata (Calcutta) to Dubrovnik is minus 4 hours. Traveling from Kolkata (Calcutta) in June, expect Dubrovnik to be slightly colder, temps between 30°C and 21°C. Finish your sightseeing early on the 3rd (Mon) to allow enough time to travel to Bol. An hour boat ride from Split on the island of Brac, Bol boasts a charming old town, pebble beach, and great windsurfing conditions. Historical charm abounds here in the form of stone houses, narrow pedestrian streets, and historical attractions marked with panels. Start off your visit on the 4th (Tue): take a tour by water with Boat Tours & Water Sports, then enjoy the sand and surf at Zlatni Rat Beach, and then appreciate the extensive heritage of Golden horn from above. On your second day here, explore the activities along Supetar Bay and then enjoy the sand and surf at Lovrecina Bay. To see other places to visit, traveler tips, where to stay, and tourist information, go to the Bol trip itinerary planning app . Do a combination of car and ferry from Dubrovnik to Bol in 4.5 hours. Alternatively, you can ride a ferry; or do a combination of bus and ferry. June in Bol sees daily highs of 32°C and lows of 22°C at night. Wrap up your sightseeing on the 5th (Wed) early enough to ride a ferry to Hvar. The Croatian island of Hvar serves as a picturesque location for a Mediterranean holiday, with a range of offerings from quiet coves to a lively medieval town. On the 6th (Thu), admire the landmark architecture of Franciscan Monastery, then get great views at Spanjola, and then enjoy the sand and surf at Dubovica. Keep things going the next day: race across the water with a speed boat tour. Ask Inspirock to suggest an itinerary and make planning a trip to Hvar fast, fun, and easy. Hvar is very close to Bol. In June, plan for daily highs up to 32°C, and evening lows to 22°C. Finish your sightseeing early on the 7th (Fri) to allow enough time to travel to Akrotiri. Located on Santorini's southwestern coastline, the small village of Akrotiri sits just a short walk from one of Europe's most significant Bronze Age archaeological sites. 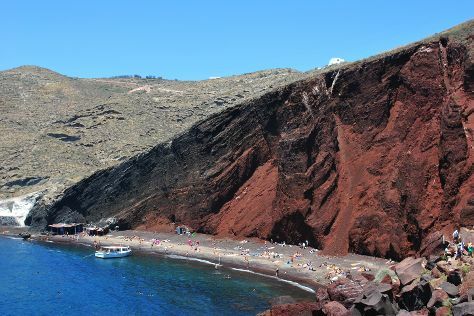 Kick off your visit on the 8th (Sat): explore the ancient world of Akrotiri, kick back and relax at Perissa Black Sand Beach, then look for gifts at Galatea Pottery, and finally kick back and relax at Red Beach. To find ratings, traveler tips, more things to do, and other tourist information, you can read our Akrotiri trip itinerary tool . Traveling by combination of ferry and flight from Hvar to Akrotiri takes 9 hours. Alternatively, you can do a combination of car and ferry; or do a combination of ferry and bus. Traveling from Hvar to Akrotiri, you'll lose 1 hour due to the time zone difference. In June, daytime highs in Akrotiri are 32°C, while nighttime lows are 24°C. Wrap up your sightseeing on the 8th (Sat) to allow time to ride a ferry to Heraklion. On the 9th (Sun), admire nature's wide array of creatures at Cretaquarium - Thalassocosmos, delve into the distant past at The Palace of Knossos, then stop by Irida Family Workshop, and finally take an in-depth tour of Heraklion Archaeological Museum. You can plan Heraklion trip in no time by asking Inspirock to help create your itinerary. You can ride a ferry from Akrotiri to Heraklion in 2 hours. In June, daytime highs in Heraklion are 32°C, while nighttime lows are 22°C. Cap off your sightseeing on the 9th (Sun) early enough to travel to Athens. Kids will appreciate attractions like Acropolis Museum and Mount Lycabettus. There's still lots to do: delve into the distant past at Acropolis of Athens, don't miss a visit to Syntagma Station, explore the world behind art at Benaki Museum, and take in nature's colorful creations at National Garden. To see where to stay, photos, more things to do, and tourist information, use the Athens day trip planning site . Do a combination of bus, flight, and subway from Heraklion to Athens in 3 hours. Alternatively, you can ride a ferry. June in Athens sees daily highs of 35°C and lows of 24°C at night. Finish your sightseeing early on the 12th (Wed) so you can travel back home.